Dianne Woodruff, PhD, the creator of 3-D Workout™, has produced an exercise video that targets more of the body than conventional chair programs and does it while seated. 3-D Workout: The Chair Edition accommodates clients with injuries or those who have difficulty moving from the floor to standing positions (and vice versa). Travellers or office workers with little space or time to spare need only a picnic bench or a sturdy chair to get a lively and varied three-dimensional workout. The exercises are suitable for all ages, young and old, individuals in rehab or anyone with daily aches and pains. Other chair videos on the market exercise portions of the body, but not the whole. The part they’re missing is the soft connective tissue that literally holds us together. Keeping this “fascia” fit, elastic and resilient, depends on a program of varied whole-body movement. When out of shape, the fascia is matted and stiff like felt. Practicing the Chair Edition rejuvenates and rehydrates the entire fascial body suit, restoring flexibility and range of motion. The program offers warm-up, strengthening and stretching with unique exercises designed in the space around the body. Dr. Woodruff uses an on-screen graphic of a cube with its corners and angles that teaches the client how to move in three-dimensions. Large, sweeping movements are done first without weights then with one- or two-pounds. 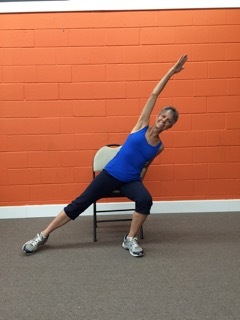 Clients report a pleasant, whole-body feeling, of being worked but not wasted, of feeling energized and alive. 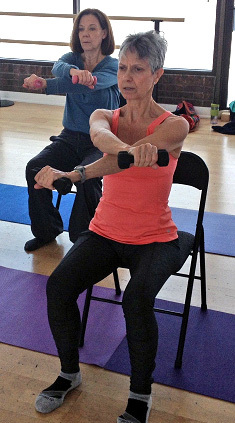 3-D Workout: The Chair Edition includes a 38-minute instructional segment that walks each client through proper technique, movement execution, use of space and breathing. A 15-minute workout segment leads the mover through these 13 sequences at a faster pace. Included in the package as a bonus is a .pdf of drawings for 3-D Back Stretch, Woodruff’s signature stretch for easing a tight back.